Madhu’s love for the outdoors began as a child exploring the granite domes of his hometown of Bangalore in Southern India. His first journey to the Himalayas in 1999 inspired him to explore high altitude mountain ranges across the world. 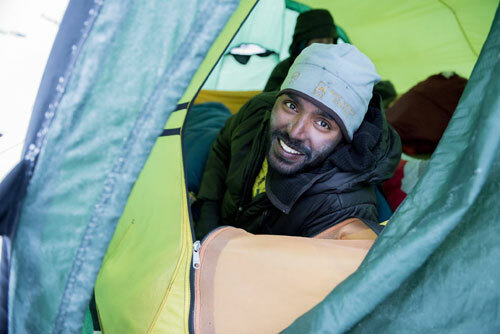 Madhu started to work as a field instructor for the National Outdoor Leadership School in 2006 where he has worked 225 weeks teaching students mountaineering and rock climbing skills. Madhu has led expeditions in India’s Kumaon & Garwhal Himalaya, Chilean Patagonia, Wyoming’s Wind River Range, North Cascades, Alaska, and the Waddington Range of British Columbia. When he is not working in the mountains, Madhu enjoys paragliding, working on his farm in India, hanging out in his tiny house with his wife, and playing on the granite rocks in his current home of Leavenworth, WA.